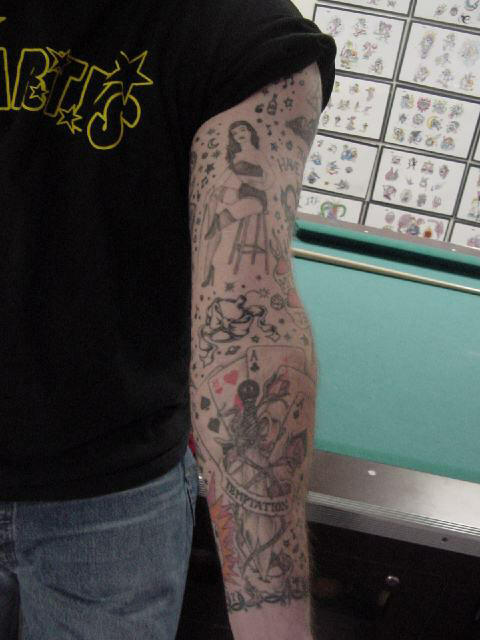 I started on my left sleeve way back in 1991 and worked on it off and on until 1997. There's a lot of images in there that cover that part of my life. I figured I might as well start at the wirst and work my way up. Wrapping around my wrist I have a tribal design of interlocking crescent moons with my birth date and symbols of my life at the time (dice, cross, horseshoe, skull, musical note, and martini glass). 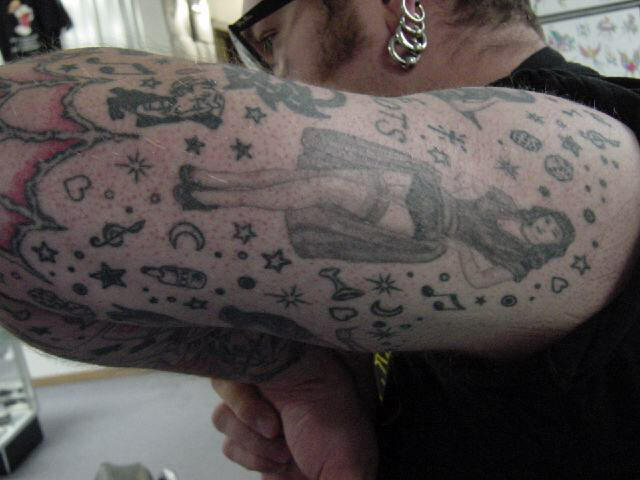 The symbols tend to set the mood of the sleeve and are repeated and used along with other symbols (whiskey bottles, stars, moons, plants, hearts and etc..) as fill. 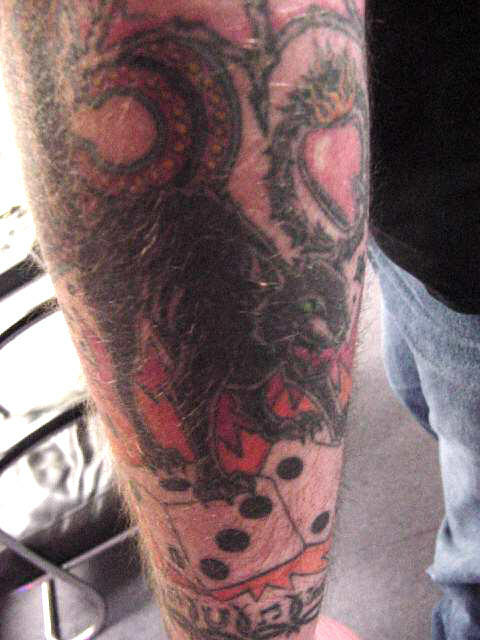 On the outside of my lower arm I wear a jinx sign a black cat standing on a set of dice with a lighted 13 in the back ground. I guess I needed a bit of protection from the evil bad luck I was having at the time. Did it help? Well... not really. Just above the cats head I have a sacred heart within a wreath. I just saw the image and had it done. It's one of those symbols you're drawn to because of a feel it has that you can't explain. I guess I just needed more protection. 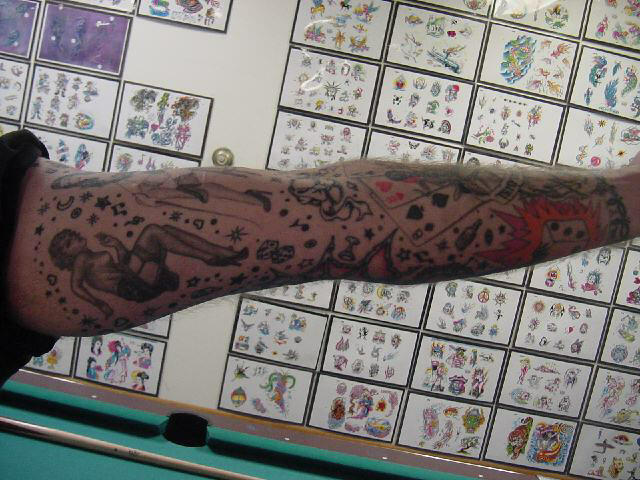 On the inside of my lower arm is the first large visible piece I've had done. I remember it came about by doodling on the back of a flyer at a show. I was sitting next to my girlfriend at the time and looking at this cute little girl across the club and just thinking. 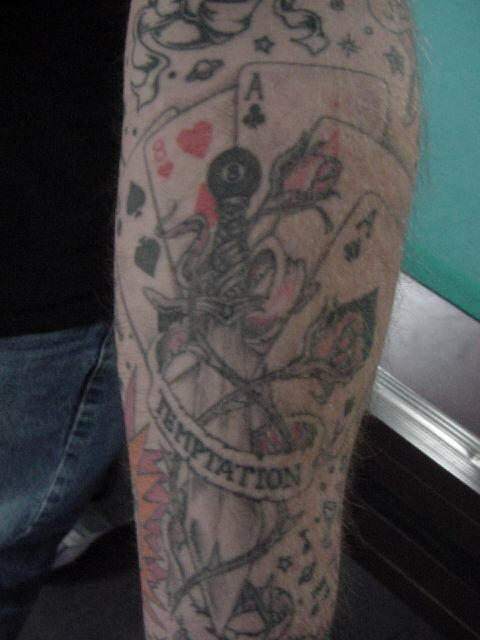 Anyway it's a dagger with an 8 ball on the handle wrapped in roses and a banner that says temptation. Get it... a reminder of the dangers of cheating. 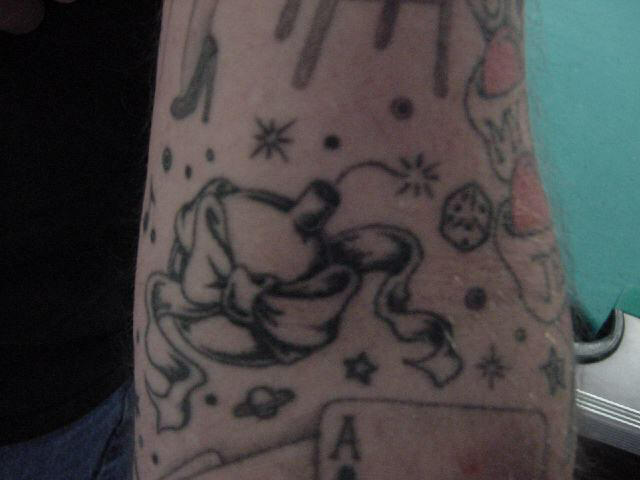 I had the Aces and Eights (dead mans hand) added later. The cards were brought on by my father's being in the hospital. They say the reason you tend to tattoo images of death on yourself is to come to grips with your fear of death. After dealing with my father's heart condition for most of my life, it's no wonder that I got this done on the eve of his second by-pass. He passed away while he was recovering from surgery. On the outside of my elbow I have a spider web. 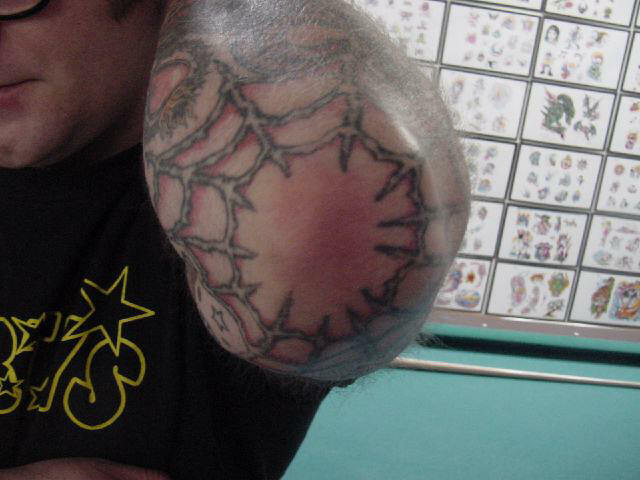 There's a lot of things attached to the spider web on the elbows. Everything from racism to prison time and murder but to me, it was mainly because I was feeling my age, plain and simple. It's unlike any other I've ever seen. I wanted a kind of empty Celtic look to it so the webbing was left empty. On the inside I have a bomb wrapped in a bow. I found the irony of a gift of destruction very touching. Between the spider web and the bomb is a tribute tattoo to my father. It's a Jerry Collins' flash of a simple heart and dagger with a banner around it. My dad had the same tattoo. He got it in Ft Riley, KS before shipping out to Korea back in the 50s. Every time I'd get a new tattoo he would ask, "How much did you pay?" I'd tell him and then he'd slap his tattoo and say, "You got took, got this for a buck and a half in a basement in Ft. Riley." He told me that he couldn't think of who's name to put on the banner so he put his own name. I added another banner that says "MY POPS" and another heart. In a lot of ways it sums up the way he was, putting his own name on a sweet heart tattoo. Like joking with the nurses as they wheeled him into surgery or like telling us he got his Purple Heart from getting stabbed with a fork in the chow line. He had this way of taking the worst life had to offer and protecting you from it with a joke. 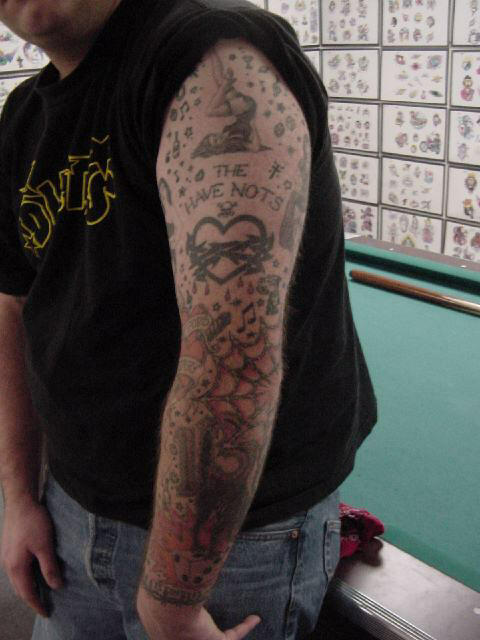 Right above that, is the first Tattoo I got on my left arm a tribal sacred heart with "the Have Nots" written above it. I've had that phrase kicking around in my head since I was a kid. I'm not sure where it came from maybe the book or the movie. In a way I don't want to know. 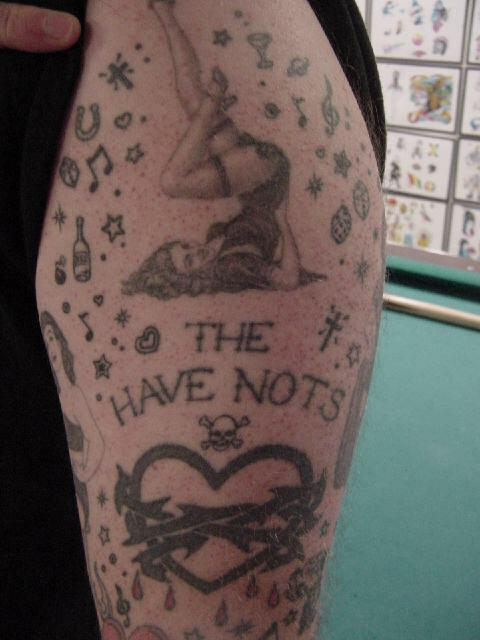 Of course what may have brought it to the surface back in 90 was my favorite drinking song the Have Nots by X. I got this done in Sherry's kitchen before she moved into the new shop on University. As a red blooded American male I love woman and to top off my arm I added a set of 4 pin ups. 2 from the the 30s-40s area of air brushed calendar girls and two from photos of Betty Page. There's also this little drunk guy I stole off an X lyric sheet. All the work on my sleeve was done by Sherry Sears at Creative Images/4817 University Ave #7/Des Moines, Iowa 50311/515-277-8288. 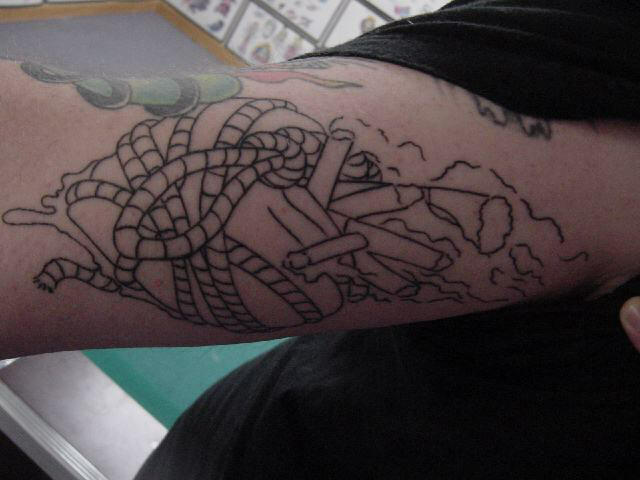 The thing I hear over and over is when are you going to start on the other arm. Well when the spirit moves me brothers and sisters, when the spirit moves me. Maybe I just haven't lived that part of my life yet. The first tattoo I got was a silly punk rock political tattoo when I was 18. I got it done back when Sherry had her old shop on E. Grand. After wearing it for about a year I hated it. I guess we all have to have one of those, right? Well as soon as I could get the money up I had it covered. Due to the fact that it was mostly tribal and very dark I didn't leave Ira (at American Tattoos in Omaha) much room to work but he did manage to hide it with a big old ugly oriental dragon. It's not my favorite but it does do it's job of hiding my mistake. The one pictured above was done by Justin "Birdman" Crawford back in 1995. He did the outline and the shading but didn't get to finish it because he passed away in February of 96. To this day he is still missed, and I feel his ghost wandering around the studio. Finally I had Sherry touch it up and bring it back to life last year (97). I drew up a basic drawing for this and then let Jay work it out into what it is now. This one had a lot to do with the fact that I was getting tired of coming up short on the whole band thing and needed to express it. So what you see is that expression.